We are extremely busy learners in FS2 learning and developing a range of skills through a balance of practical, play based experiences and adult led/directed activities. We are growing in independence as well as enhancing our social and emotional skills. Together we are laying some very strong foundations for our future! Please send us to school prepared for the day. Each day we will need correct school uniform (see the schools uniform policy), a coat, and our book bag with our reading book. If we wish we can bring a named bottle of water. We are learning to look after our own belongings: you can help us by putting our names in each item of uniform (this includes coats, hats, scarves and wellies) so we can have our things returned should they go astray! In Reception we are starting out on our journey of love and friendship with the Lord. We are learning to follow in his footsteps and know that each of us though very special and unique, have been made in the Lord’s image and likeness. 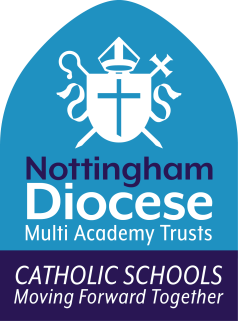 To support us in our growing relationship with the Lord, we follow the Come and See Programme, alongside all other schools in our Diocese. We will bring home a newsletter each term about the topics we will be covering – you can help us by looking at what we are going to be doing and talking to us about it. In addition, if you have any photos, artefacts or information that may help us with our learning and could send them in we would be very grateful. Alongside our RE lessons we have daily acts of worships. Our parents and friends of the school are welcomed to our special liturgies on Wednesday and Fridays. We would love you to join us at these special times. Each Monday afternoon, we enjoy an indoor PE session. This promotes Physical Development in a structured way. Our PE kit should come in with us at the start of the half term and will be returned at the end of the half term. Like with school uniform our PE kit must be named. As well as literacy activities, we have a daily Phonics session which follows the Revised Letters and Sounds programme (you can find information on this on our website). Each day we learn a new phoneme/grapheme or a tricky word and then apply this in our reading and writing. Each week we are given a reading book to read at home. We are asked to read at least 4 times a week at home with an adult/ older sibling and this needs to be recorded in our reading diaries. Reading at home will help with our growing phonic knowledge as well as promoting our comprehension of a text and reading fluency. Our reading books are changed on a particular day – please see our classroom noticeboard for details of when this is. Alongside our reading book we also get a school library book. The library book is for us to share as a family – we are not expected to read it! We get homework to support our continued learning and also give you an insight into what we are learning in school. We have one piece of homework a week either: Writing, Number, Shape or RE based. Our homework is set on a Friday and is due back in on a Wednesday. If for any reason you are struggling to complete homework please speak to one of our teachers – they will do all they can to help you. Our teachers are always available if you need to speak to them. – You can write a note in our reading diaries. – If it’s a brief chat you’d like, they will try their best to speak to you at the reception class door. – If you think you need a longer chat please speak to the school office and they’ll arrange a meeting for you. Thank you for your continued love and support – we can only achieve all we wish when together we work as a team.